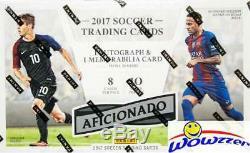 2017 Panini Aficionado Soccer Factory Sealed 12 Box HOBBY CASE-24 AUTOGRAPH/MEM. 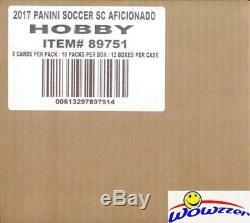 We are Proud to offer this 2017 Panini Aficionado Soccer Factory Sealed HOBBY CASE! This Factory Sealed HOBBY CASE includes TWELVE(12) Factory Sealed HOBBY Boxes! Each of these Awesome Factory Sealed HOBBY Box includes 10 Packs and 8 Cards per Pack! EACH Factory Sealed HOBBY box includes One AUTOGRAPH, One MEMORABILIA Card, Five Inserts & Ten Parallel Cards! So you get a Total of TWENTY-FOUR(24) AUTOGRAPH or MEMORABILIA , (60) INSERTS and (120) PARALLEL Cards in this 12 box Factory Sealed CASE! This Product is Absolutely Loaded! Look for Autograph, Memorabilia, Parallels and Cards of all the Biggest Superstars and Legends in Soccer including Diego Maradona, Pele, Lionel Messi, Cristiano Ronaldo, Neymar Jr, Gareth Bale, Christian Pulisic, Manuel Neurer, James Rodriguez, Filippo Inzagh, Robert Lewandowski, Renato Sanches, Delei Alli and Many More! This Product showcases some of the best Soccer club & national teams in the world including Real Madrid, FC Barcelona, Bayern Munich, AC Milan & Many More! Featured national teams include the Argentina, Germany, Brazil, Portugal, US, England, Italy, Spain and Mexico! Look for Variety of Special Inserts such as Magic Numbers, Power Surge, Craftwork & Meteor! Plus Find Soccer stars of the Past in Heroes! The Aficionado Base set features a Unique Design that includes Both a Close-up Photo and an Action Shot of Each Player! Look for Sequentially Numbered Memorabilia Cards of the World's Best Players in Authentics and Dual Authentics as well as Prime Parallel edition of Both! Look for 10 different Special Forza! Insert Cards found 1 per Case! Good Luck with your Pulls! Wowzzer is the Source for all the Best Soccer Cards & Sticker Products from around the World including the Amazing Official Lionel Messi Cards of the World's Biggest Superstar! We have Huge Selection of Panini and Topps Products of Champions League, Premiere League, World Cup, Copa America Cards and Stickers! We stock a Huge Selection of Factory Sealed Boxes from every Sport! Plus the Largest Collection of Graded Cards in the World! Note on Factory Sealed Boxes and Cases and Graded Cards. S samples and are not guaranteed to be in any particular box or case. On Listing for Beckett BGS Graded Cards. We answer all emails within about 24 hours Monday through Friday. We are an Internet only company; we do not have a retail location. Get business information that counts! - Vendio Counters are active content free. The item "2017 Panini Aficionado Soccer Factory Sealed 12 Box HOBBY CASE-24 AUTOGRAPH/MEM" is in sale since Saturday, December 9, 2017. This item is in the category "Sports Mem, Cards & Fan Shop\Sports Trading Cards\Football Cards".